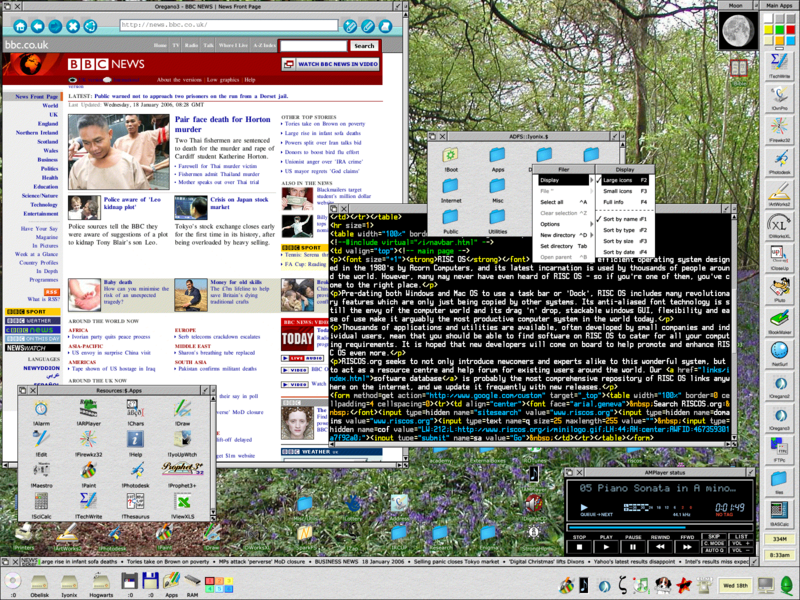 RISC OS is the operating system of choice for thousands of users around the world. Yet, many people have never even heard of it. I guess those who HAVE used it know how pleasurable and productive it's use can be, whereas those who have yet to experience it for themselves continue to think computers are bad, unreliable things that keep going wrong or doing things you don't want them to do. RISC OS was the revolutionary operating system devised by Acorn, back in 1987 to power the world's first ARM based personal computers (despite what Apple claimed at the time!). Yes, Acorn were also the inventors of the ARM (Acorn Risc Machine) chip, which is arguably the most abundant micro processor in the world today, powering thousands of devices from mobile phones, personal electronic organisers and printers to desktop computers and video game consoles. To this end, RISC OS is the only operating system which allows you to learn ARM machine code programming 'out of the box' with no additional tools or software. Although Acorn, the original manufacturer is no more (it got snapped up and sold when accountants realised that it's ARM shares were worth more than the parent company), manufacturing rights to the powerful Risc PC range of personal computers (PCs) passed to Castle Technology Ltd who continued to manufacture them right up until 2004. However, Castle weren't sitting back doing nothing. They were secretly developing a new machine based on modern ARM technology, the superfast, power economical X-Scale processor. In 2004 they announced to the world the Iyonix computer, which was met with critical acclaim not only by long-term Acorn enthusiasts but also by intelligent computer users around the world who were fed up with Microsoft based PCs being unreliable and inefficient. So, what's so fantastic about RISC OS then? Why is it such a secret weapon�amongst those who use it, yet relatively unknown throughout the world? The reason I call it a secret weapon is that it gives me the edge in my business - which is a huge benefit in todays high competition IT industry. The biggest advantage is its sheer productivity. RISC OS gets the job done - and I'm usually finalising a job just as a similarly competent Microsoft user is struggling on the first stage of the task in hand. This allows me to give better quotes, quicker response times and faster turn-around of time-critical contracts. For example, by using RISC OS I can usually guarantee to undercut a web design quote and, at the same time, get it done in half the time. I guess that in summary, RISC OS tools and applications are simply more intuitive, more productive and 'nicer' to use. Rather than try to list here, the hundreds of advantages of RISC OS over alternative's such as Windows and Mac OS, the following links serve to highlight some of the key features. 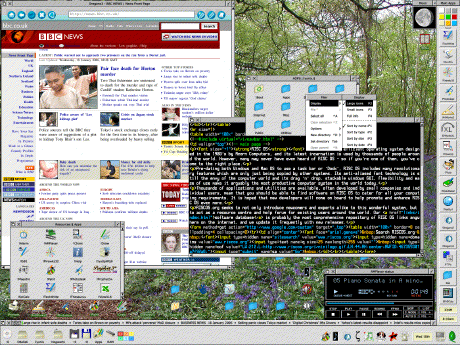 Ric's RISC OS Page - A personal perspective from a user. Windows don't jump to the front when you click on them. You can type in a window which is partially covered without it immediately jumping to the foreground and possibly obscuring other windows. Window scroll bars are properly proportional and 'lock' the mouse when you drag them - so that you can't accidentally 'slip' off them. Anti-aliased font quality is far better than anything Windows or Mac OS X has to offer, and includes sub-pixel anti-aliasing. Use of the MENU mouse button eliminates toolbars and drop down menus from obscuring your screen and making the visible work area smaller. All menus automatically expand to the maximum size of the screen, automatically adding scroll bars if there are too many items to display - none of the little tiny menu windows with 100's of options to scroll through! An intuitive and efficient filing system and file manager which supports true drag and drop without the tedious Windows style 'Open document' window dialogue. Extremely responsive desktop where windows can actually be dragged behind other windows, minimised, maximised, dragged off screen or scaled to the size you require. Applications which can simply be copied to your hard disc (or any other filing system) without the need to install them - and they reside in the directory you place them in, without hidden files or unknown files going into other places. The ability to delete applications simply by deleting them, knowing that no hidden files or extraneous files will be left behind. True drag and drop makes swapping data, text and objects between applications a doddle - and so much faster than other systems. If you have your own preferences or even websites detailing other advantages, please feel free to contact us and we'll link to it from here.